Shopping for Star Wars Phone Accessories? There's an easier and safer way to tap into the power of the Dark Side with this Star Wars Death Star USB Wall Charger. Measuring 2 3/4-inches across and extending 1 3/4 -inches from the wall, it plugs into a grounded outlet and provides you 2 USB ports - one 2.1A and one 1.0A. Plus, it lights up when receiving power! 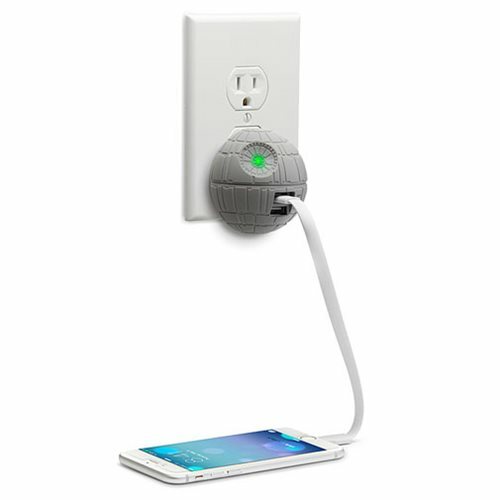 Plug in and power up with this Star Wars Death Star USB Wall Charger! Charging cord is not included. Ages 13 and up.